Did you know that the December Solstice represents two different things depending on what hemisphere you’re located in! In the Northern Hemisphere it is known as the Winter Solstice, while in the Southern Hemisphere it is known as the Summer Solstice! 1. The sun on the December Solstice shines directly over the Tropic of Capricorn (latitude 23° 30′ South) in the Southern Hemisphere. 2. The December Solstice can occur from the dates of December 20-December 23, however falling on the 20th or the 23rd day of the month is extremely rare. 3. The last time the December Solstice fell on December 23rd was in the year 1903 and it will not happen again until the year 2303! 4. The term solstice comes from the Latin word solstitium, meaning ‘the Sun stands still’. During the December Solstice, the Sun reaches its most southern position as seen from Earth and appears to stand still at the Tropic of Capricorn and then reverses its direction. 5. People tend to say that during the Winter Solstice the Earth is furthest from the Sun, however this is a MYTH! During the Winter Solstice, the Northern Hemisphere is actually closest to the sun! So what do you think? Are you excited for the December Solstice to mark either the first day of winter or the first day of summer depending on your geographic location? Comment in the conversation bubble located on the top right corner of your screen and let us know! 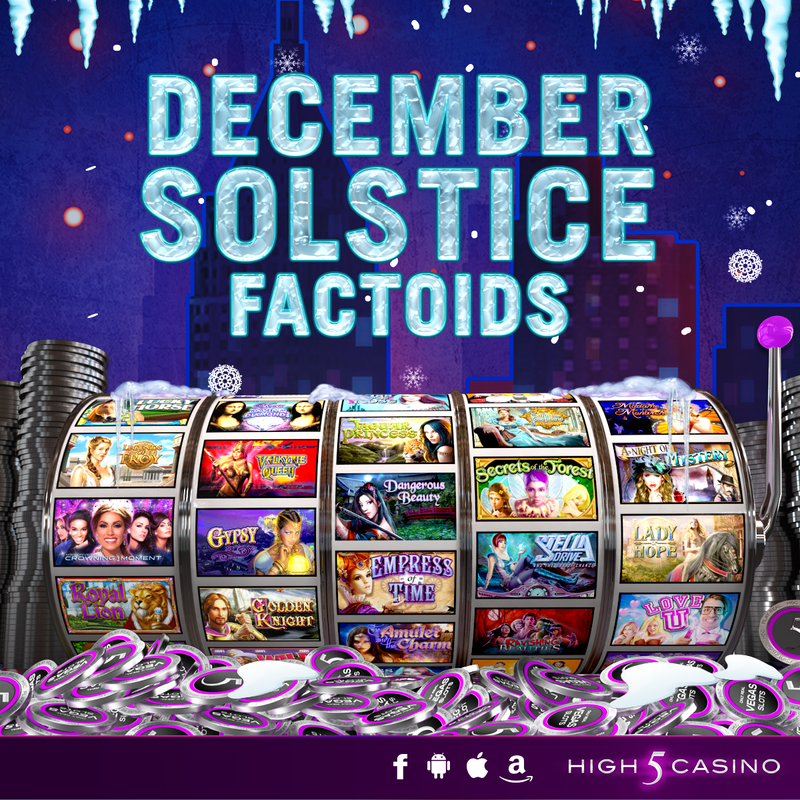 This entry was posted in factoids, High 5 Casino, High 5 Games, High 5 Vegas, Shake the Sky Casino and tagged 2016, Android, App Store, Apple, December 21, December Solstice, Facebook, factoids, facts, First day of Summer, First day of Winter, Free Games, High 5 Casino, High 5 Casino Mobile, High 5 Games, iOS, iPad, iPads, iPhone, iPhones, mobile gaming, Northern Hemisphere, Shake the Sky Casino, Shake the Sky Casino Mobile, slots, social gaming, Southern Hemisphere, Summer Solstice, Tropic of Capricorn, Winter Solstice by hoothigh5. Bookmark the permalink. What does it take to rise up the VIP latter ? Hi Sandra, to move up in VIP status all you have to do is log into High 5 Casino daily, send gifts to your friends and purchase coin packages! Our system logs those three actions, therefore the more they’re performed, the more you’re advancing! Here in Southern Canada – Ontario. The whole solstice thing is not a joke. Our days have become so much shorter and depressing – it will be so good to enjoy more daylight. June 21st is the longest day, with the most hours of sunlight, December 21st is the shortest day, with the most hours of darkness. I think we enjoy the warmth of Summer so much, we forget that Winter is unforgiving. But then, I’m a Summer person and will pay to follow the sun and it’s warmth.